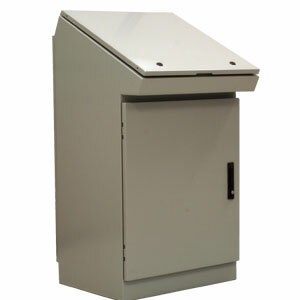 The SCE-DC Series of operator desk consoles are intended for indoor use to house electronic and electrical instruments and controls. These operator control consoles will protect electrical components against introduction of solid foreign objects, falling dirt and water. The SCE-DC operator work stations can be used in a standing or sitting position and can allow for installation of operator interface, control pushbuttons and selector switches. The desk top includes hardware so it can be propped open for easy access, optional key lock latches are available for additional security. Models are available with one or two door access in both the front or front and rear of the enclosure. Sub-panels are available for mounting electrical components and dual access models come with channels for more then one sub-panel installation. Finish: ANSI-61 gray powder coating inside and out. Optional sub-panels are powder coated white. Set of 4 Leveling Pads, 3/8-16 thread, zinc plated with plastic base. Note: Mounting hardware is supplied with the first sub-panel, if additional sub-panels are required you will need additional mounting hardware.